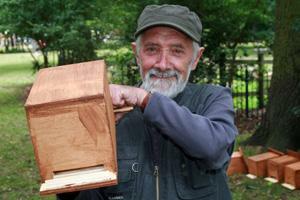 The installation of nine bat boxes in an Essex park crowns the commitment of a local authority to restore the health of mature trees for the enjoyment of future generations. Having pruned some of the trees, and felled a number of dead Oaks, (some of which bore shrapnel in their wood from the second world war) Liz along with the council’s Horticultural Manager Luke Love used funding from Veolia ES Cleanaway Mardyke Trust to commission specialist aeration contractors Terrain Aeration to perform one-metre deep, compressed air de-compaction treatment to the remaining trees. Working at one metre spacings in two circles, one, a metre outside the canopy and another, one metre within, the company used their Airforce Terralift machines to insert a 1 ¼ inch diameter steel probe a metre into the subsoil and inject compressed air into the root zone. Dried, milled seaweed was injected on the final air blast to add nutrients, and, as it swells when wet, keep the newly created air channels open. “We wanted to allow the roots to breathe and I liked the idea of using air to de-compact,” Liz explains. As a result of using the Terrain Aeration process accumulated rainwater that previously sat in puddles on the surface is at last reaching the roots. “This year we’ve had plenty of rain and now, that rain is benefitting the trees,” Liz confirms. By this summer the condition of the treated trees had improved significantly and bat boxes were installed. With the help of Alan Mitchell a council contractor and his fellow Rotary Club members’ Cherry Picker, South Ockendon Community Forum and The Friends of Dilkes Park (who all support the park and this venture) the boxes will provide a habitat for many local bats.